Land reform farms in the Central Karoo district of the Western Cape province of South Africa were surveyed in 2008 to gather baseline data on the infrastructure, production practices and economic viability in order to align extension and farmer development programmes of the Department of Agriculture in the Central Karoo to farmer needs. On-farm personal interviews with the managing members/decision makers of 15 farms were conducted. This paper reports on the farm structure, farm potential, farmer profiles and farm management knowledge and practices of land reform farms. Farms are held in the form of community land trusts with fairly large numbers of beneficiaries who do not reside on the farm. Large group numbers and a lack of co-operation or complete non-involvement in trust matters made it difficult to manage conflicts and power relations within the trust and to reach consensus on farming matters. Farms in general seem to be too small to provide a sustainable livelihood, given the number of trust beneficiaries and the resource potential of the land. Smaller farms tend to have lower carrying capacities which limit the income potential of smaller farms further. Agricultural managers were found to be mostly middle-aged to elderly men, with education levels ranging across the full spectrum, but 40% at intermediate level and lower. Most of the agricultural managers live off-farm and hold other jobs, making management of agricultural operations more challenging. Prior experience of farming is mostly limited to labourer and commonage farmer level. Coupled to this, limited management and scientific knowledge and skills affect the extent to which production-, marketing- and financial management practices are aligned with commercial business practices. Baseline evidence highlighted a number of important areas to be considered in farmer development and extension to land reform farmers. Establishing a set of baseline data can assist in future monitoring and evaluation of land reform project successes/failures and contribute to the development of a co-ordinated extension and development programme. Since the democratization of South Africa in the early nineties, land reform has been one of the most important issues shaping the agricultural landscape. Government research and extension services have been transformed systematically to deal with the new demands of land reform policies (Terblanche, 2008). Business plans were developed by external consultants for the Department of Land Affairs to serve as blueprints for agricultural development of land reform farms. These business plans seem to have had limited impact on the development of farms so far and are increasingly being criticised for being too ambitious for the knowledge and skills levels of land reform beneficiaries (Marais, 2008). At the micro-level it now becomes increasingly important to custom-fit extension interventions to the specific needs of new land reform beneficiaries in order to largely fill the void created by over ambitious and often impractical business plans. To avoid a repeat of the business plan scenario, a need for accurate and solid baseline information is needed. This study reports aspects of a baseline survey conducted in the Central Karoo at 15 land reform farms in order to generate baseline data to inform the development of future extension interventions. The purpose of the assessment was mainly to evaluate the farms for infrastructural, production and economic viability. The paper starts with a description of the typical farm structure and farm potential, followed by a profile description of the agricultural manager/decision maker of the average farm. It then describes production-, marketing- and financial management practices and conclude with some implications for extension. An assessment of the economic viability is reported in a separate article. A questionnaire was administered to each land reform farm in the area and data sourced by way of on-farm personal interviews with the group of managing members/decision makers of each farm. The person in the management committee that provided leadership and management in terms of farm operations (the "agricultural manager") was targeted as the main source of information. All LRAD and SLAG farms (n=12) and Agrarian farms (n=3) were surveyed. Data was collected on biographical characteristics of agricultural managers, on farm structure and production potential of the land and on the production-, marketing- and financial management practices. Analyses were conducted for each farm separately for the 2007/2008 year to serve as baseline for future monitoring and evaluation. The baseline year is 2008. This paper reports outcomes in terms of averages for the group of 15 farms collectively. All the SLAG and LRAD farms are organised in community property trusts. Each trust has a management committee to oversee management and administration. Trusts have on average 23 beneficiaries (min = 2; max = 69), with 42% being female and 6 % youths. Trust group sizes were found to be proportional to the purchase price of farms, since beneficiaries pooled their initial SLAG grants of R 16 000 per household to buy farms. The more households, the more funds were available to purchase land and the lower the need for loan funding. This was also found in other studies on land reform in South Africa (Agri-Africa, 2005; Anseeuw & Mathebula, 2008; Lahiff, 2008). Farms are situated on average 51 km from the nearest town or market. Farm size ranges from 846 ha to 6033 ha, with the average size 2684 ha. 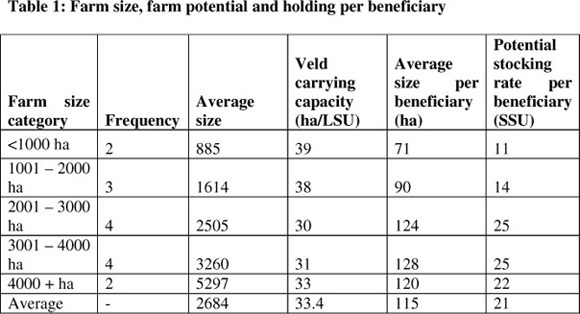 Table 1 shows that 9 farms (60%) comprise 3000 ha or less, which in general terms seems to be relatively small compared to the typical commercial farm (> 5000 ha) in the region (Grobler, 2009). The average farm size per beneficiary is 115 ha, but differs for the different size categories. Table 1 shows that smaller farms seem to have less hectares available per beneficiary. The carrying capacity of the veld ranges from 24 ha/LSU to 42 ha/LSU, with an average carrying capacity of 33.4 ha/LSU. The carrying capacity for smaller farms tends to be lower than those of bigger farms. This could be a result of overutilization over many years in pursuit of a liveable income. Coupled with a smaller number of hectares per beneficiary (or a larger group size) on smaller farms, the potential stocking rate per beneficiary is also lower and therefore the potential for deriving a decent income as well. Table 1 shows that on smaller size farms only 11 small stock units (SSU's) can be kept per beneficiary, whereas for larger farms the potential stocking rate improves to 22 SSU's - 25 SSU's per beneficiary. The stocking rate of farms is currently 46.92 ha/LSU on average, suggesting underutilisation of the capacity. The underutilisation is mainly due to the fact that more than 30% of the farms have being transferred to the new owners only 2 years prior to the study. These farms were still in a phase of building up stock numbers. A total of 5809 SSU equivalents of sheep and goats are carried on the 15 land reform farms in the Central Karoo. The main enterprises are Dorper sheep (72%), Merinos (12.5%), Afrino/crossbreed (8.7%) and Angora goats (6.6%). Dorper sheep are farmed by 80% of the farms, Afrino/crossbreeds by 27% of the farms, Angoras by 27 % and Merinos by 6.7%. The average flock sizes are 326 SSU's for Dorper sheep, 117 SSU's for Afrino crossbreds, 677 SSU's for Merinos and 90 SSU's for Angora goats. Table 2 illustrates the biographical characteristics of the agricultural managers. The age of agricultural managers ranges from 40 years to 75 years, with an average of 54 years. About 73% of the agricultural managers are older than 50 years. Their academic qualifications are diverse, ranging from no schooling to one individual with a B.Com degree. About 60 % have a scholastic level of Grade 10 and higher; by implication it means that 40% of the managers have a fairly low level of education. 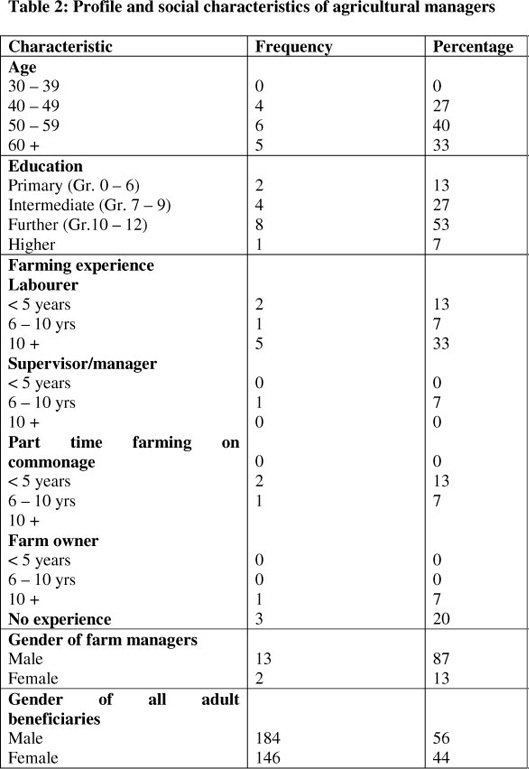 A breakdown of farming experience of agricultural managers, prior to participation in the land reform process, reveals that only one farmer had farm ownership experience. This farm is however one of the Agrarian farms who have been in the family for more than one generation. The majority of the agricultural managers derived their farming experience from either being labourers on commercial farms (53%) or from engagement in part-time farming on municipal commonage land (20%). Only in the case of one farm was there a period of prior experience in a farm management/supervisory capacity. In the case of three farms agricultural managers had no prior farming experience. In a study of agrarian reform projects in the Western Cape, similar results on farming experience was reported by Agri-Africa (2005). In terms of gender, most of the agricultural managers are males (87%). This concurs with studies on small-scale livestock farmers in the Eastern Cape - (Mahanjana, Cronje & Botha, 1996), the North West- (Marfo, 2000) and Free State (Lehloenya, Greyling & Schwalbach, 2007) provinces of South Africa where most farms were headed by men. In terms of the total number of beneficiaries of an average trust, the gender profile seems to be more balanced, with females totalling 44%. On 27% of the farms, family labour is the sole source of labour. A total of 17 labourers are employed full-time and three part-time on the 15 farms, indicating a fairly low capacity for employment creation. This seemingly limited job creation potential of land reform projects was reported earlier by Agri-Africa (2005) in a study of land reform projects in the Western Cape. Less than one third of agricultural managers live on the farm - the majority holds other full-time employment in nearby towns and visits their farms once a week. All respondents reported aspirations for becoming successful commercial farmers generating profits from their newly acquired land. An assessment of production management knowledge and practices revealed the following animal husbandry practices: at 87% of farms it was indicated that production records are kept, yet respondents were not able to produce records or furnish information from records readily. Records of stock numbers and number of animals bought and sold are more readily kept (93% of farms), but records of production performance (reproduction, weights, etc.) are kept to a lesser degree. Since production performance could not be established, an effort was made to quantify the lamb marketing percentage (number of lambs marketed as a percentage of breeding ewes mated) per year. 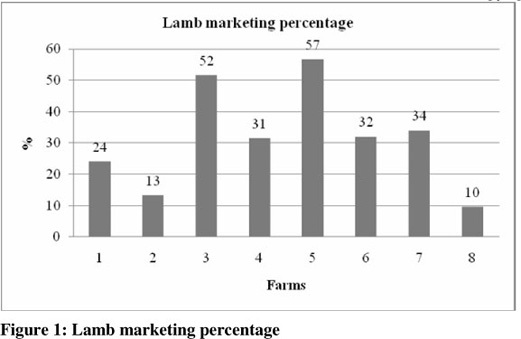 Figure 1 represents the lamb marketing percentage of those farms that were in full production up to the time of the survey. The low marketing percentage on many farms can be ascribed to low reproduction, drought related mortalities and stock losses due to problem animals. A range of problem-animal management practices were reported, but no co-ordinated and planned efforts were reported. The main practice cited for control of problem-animals was hunting. At 93% of the farms, herd health practices were reported to be in line with generally accepted commercial farming practices; however, knowledge about herd health issues were found to be lacking, as well as evidence of the implementation of health management programmes. Cases of Brucella ovis was found in some of the herds, negatively affecting ram fertility. At 73% of the farms use was made of the ram testing and health screening services offered by the Department of Agriculture's Veterinary Services division, mainly because it is offered as a free service to land reform farmers. About 50% of the farms indicated a practice of having definite breeding seasons, with the remainder following a practice of rams running with the ewe flock throughout the year. Breeding and selection practices revealed a common practice of breeding own rams for sire replacement and, in addition, a large percentage of the young ewe lambs were annually retained in the herd as replacement breeding stock. In general, the age distribution of breeding rams tended to be skewed towards older rams in the herd. No supplementary feeding practices were reported, other than emergency drought feeding. All farmers use ear tags or ear markings. These are mainly for stock identification purposes and is not being used for management purposes (e.g. for identifying different age groups, different performance groups, etc). Although 73% of the farms are in possession of a farm map, it is not used to the full extent for planning purposes. Stock management and grazing management plans and calendars are basically not in existence, or not used (27%). No pro-active drought planning were evident from farmers - those that expressed concern about drought incidence focused more on emergency feed purchases than on veld management and stocking rates. Most farmers seem to have a fair knowledge of the carrying capacity of their farm. Despite this, six respondents overestimated the potential of their veld and four of the farms (27%) were found to grossly overstock their veld. 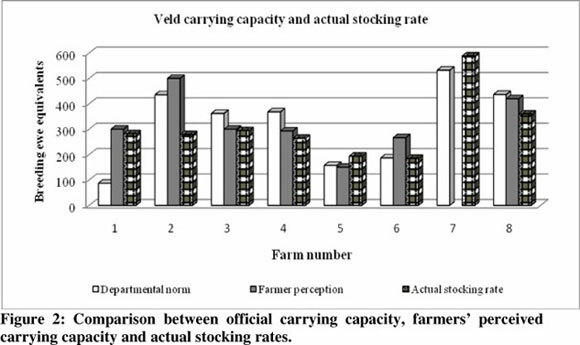 A comparison between the official carrying capacity norm as recommended by the Department of Agriculture, the individual farmer's perception of his/her farm's carrying capacity and the actual stocking rate per farm is shown in Figure 2. (Note: carrying capacity and stocking rate is expressed in terms of breeding ewe equivalents and include all types of livestock such as horses, goats, game, etc.). An assessment of marketing management knowledge and practices revealed the following: some 67% of farms have a definite marketing season, mostly linked to the biological cycle of production/reproduction. Marketing decisions are mainly based on weight requirements of the market, whereas only 20% of farms base their marketing decisions on known seasonal price cycles within the production year (e.g. Christmas, Easter, etc.). Some 40% of farms indicate that marketing decisions are driven by cash needs, either for repayment of debt or for covering normal running costs. In general, farmers indicate that they are knowledgeable about the quality requirements of the mutton market and 80% indicate their satisfaction with prices received. Separate marketing records are not kept readily and farmers rely on abattoir statements for information on weights, prices and marketing costs. An assessment of financial management knowledge and practices revealed the following: 73% of farmers indicate that they maintain financial records. However, respondents were not able to produce evidence of such records, or provide reliable information of financial performance. Accountants or lawyers seem to assist with basic accounting services. A common practice is to accumulate invoices and receipts as a source of financial information. No planned practices of financing and debt repayment scheduling are evident. Most debt repayment practices are determined by lenders and banks. There is little evidence of cash flow planning. Only 53% of farms report that profits are calculated annually, which is mostly done by accountants and/or lawyers (80%). Of all the farms surveyed, 60% were in a position to sufficiently explain the concept "profit", but over 90% of respondents were unable to explain any of the financial statements needed in a business. In terms of general financial decision making, banks, accountants and fellow farmers are playing an important role as information sources. As mentioned earlier, respondents were not able to produce records or furnish information from records readily, indicating the absence of basic general management information systems. In terms of decision making, respondents make use of networks for acquiring information. The following information sources are reported: for technical decisions, fellow farmers (40%), market agents (27%) and officials of the Department of Agriculture (27%) are consulted; for marketing decisions market agents (47%), abattoirs (47%) and fellow farmers (20%) are consulted; for pricing decisions abattoirs (40%), auction sales prices (27%) and market agents (20%) are mainly used; for financial decisions banks (27%), accountants (20%) and fellow farmers (20%) are used as information sources. In terms of training and personal development decisions the Departments of Agriculture and Land Affairs appear to be the major sources of information. Operational constraints cited by most agricultural managers mainly relates to the following: a lack of finances (operating capital) or low income potential of land (73%); 53% was found to have too many beneficiaries in the trust and experienced a lack of co-operation or complete non-involvement in trust matters (also reported by AgriAfrica, 2005); the incidence of drought and insufficient water resources (47%); problem-animals such as jackal and caracal (33%); infrastructure needs (transport, fences) (33%) and the service delivery capacity of Government (33%). Apart from the above, all farms reported that, in the event of a trust member wishing to opt out of the trust, the farm would not have sufficient funds to pay out such members. The study has highlighted a number of important areas to be considered in farmer development and extension to land reform farmers. Agricultural managers are mostly middle-aged to elderly people with education levels across the full spectrum, but 40% at intermediate level and lower. Prior experience of farming is limited and mostly at labourer and commonage farmer level. There is a definite shortage in terms of management and scientific knowledge, skills and practices. Most of the agricultural managers live off-farm and hold other jobs, making management of agricultural operations more challenging. Farms are held in the form of community land trusts with fairly large numbers of beneficiaries who do not reside on the farm. Management committees cited large group numbers and a lack of co-operation or complete non-involvement in trust matters as being problematic. Too many beneficiaries per trust make it difficult to manage power relations and conflicts within the trust, and to reach consensus on farming matters. Farms in general seem to be too small to provide a sustainable livelihood, given the number of trust beneficiaries and the resource potential of the land. Smaller farms tend to have lower carrying capacities which limit the income potential of smaller farms even further. Large group sizes effectively re-create communal farming on a limited size landholding with a real chance of environmental and resource degradation. An audit or farmer profiling for new entrants to determine the target beneficiary's cognitive development level in order to determine the complexity of interventions, implementation systems and farmer and farm system development phases. Clients with different levels of agricultural knowledge and experience demand that more farm- and context-specific technical, scientific and training support be given. Support and training needs to be given to assist farmers to bridge the knowledge and skills gap between being a "labourer" to being a "manager". Modes of communication to clients across the education spectrum need to be adapted accordingly. The "absent landlords" will be difficult to reach on the farm, demanding careful programme planning and time-scheduling of extension interventions. Extension planning needs to take into account the challenges associated with support to large groups of beneficiaries per farm - firstly because beneficiaries are not residing on farms, they may not be present during attempted extension and training interventions, and secondly the conflict and lack of consensus prevailing in trusts may influence the effectiveness of the extension message. Extension interventions on the development of social skills relating to group dynamics, conflict resolution, project appraisal etc. should be offered in addition to technical support (provided that extension officers are also trained in such fields). Extension officers need to be pro-active in the early planning phase of new projects to ensure consideration is given to the number of beneficiaries allowed to own a portion of land by matching the carrying capacity (and income potential) of land with livelihood requirements. Structuring of post-settlement support (CASP funding) in line with farm potential and the development trajectory of farms to prevent continued dependency on state funding. Since farms are all on different development trajectories, it necessitates context-specific extension interventions per individual farm. The collation of baseline data can play an important role in this context and need to be entrenched as a best practice when establishing new land reform farms. This baseline data can then be used to "custom-fit" the extension intervention to each farm individually. Over time a database of baseline norms can be generated for use in business planning and viability studies for first-time land reform applications.